Carlos and I went down to Philly on Saturday and meet up with Diana and we went to the Italian Market. 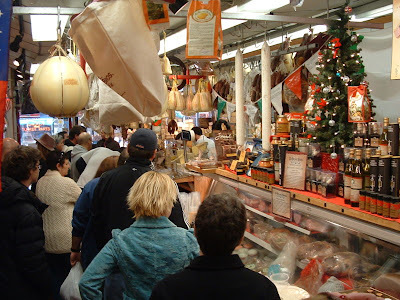 The Italian Market is the popular name for the South 9th Street Curb Market, an area of Philadelphia featuring many grocery shops, cafes, restaurants, bakeries, cheese shops, butcher shops, etc., many with an Italian influence. 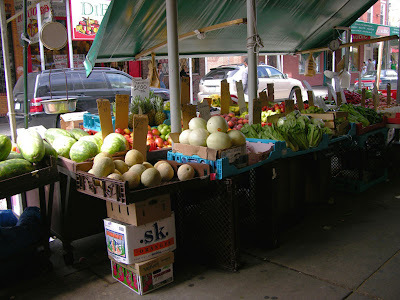 The market also plays a role in Culture of Philadelphia. It is often included in cultural depictions of the city. 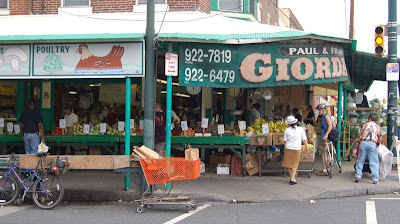 For example, The Italian Market was featured in Rocky. Most notably, the running/training montage where a vendor tosses the boxer an orange. The television series Hack also filmed several episodes that featured the Italian Market. This is how it looks like on weekend in this famous store. Look at the beautiful flowers on the windows around the neighborhood. We wanted to have breakfast here but there was a long waiting line so we end up eating Hoagies at Diana's apartment. bunga yang kat window tu arranged or memang hidup kat pasu? cantik sesangatlah. Even the movie rocky pun ada scene kat italian market kan? i love tht colourful window and flowers tu Gert. eh diana is not staying w u? p.s. when r u gonna be here again? It always nice to go jalan2 during the weekend. 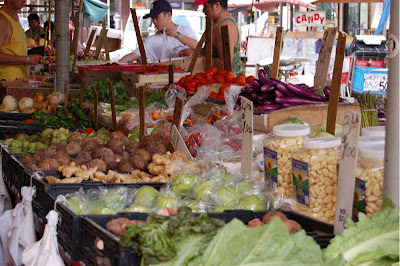 I love wet markets like this.. All the fresh produce. Remember the wet market in Malaysia... So wet, some Ah Soh has to wear teropah (clog)... Hehe. wow Philly Italian market look real like Italian mafia movie,kalah Little Italy in NYC! !.I guess all the food they sell in the market are almost the same like cheese,ham and pasta. What a nice way to spend a weekend morning! Were there any gelato shops?? Nice market, I always love going to wet market or night market. So many things to see and enjoy strolling around the market. p/s: I am sorry for your lost and my deepest condolences to you and your family. Yatie, thank you for your kind words. I like the flowers so beautifully bloomed. 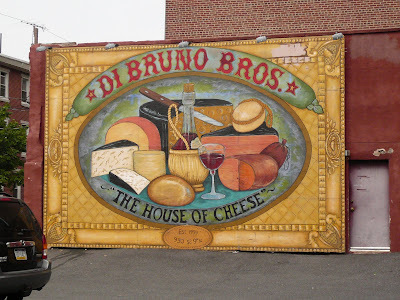 I'm originally from Philadelphia - grew up there, not far from the Italian Market. Nice to see it hasn't changed much since I left!